(WASHINGTON) -- The Federal Aviation Administration ordered U.S. airlines Thursday to replace a part that has come under suspicion in the crash of Air France Flight 447. U.S. air safety authorities have ordered the replacement of a part on A330 planes following the crash of Air France Flight 447. The FAA gave airlines 120 days to replace devices that could be giving false airspeed indications. All 228 people on Air France Flight 447 were killed when the Airbus A330 plane crashed June 1 en route to Paris, France, from Rio de Janeiro, Brazil. The U.S. air safety watchdog agency bypassed the usual process which allows for public comment on its orders. It said it could expedite the process because of the limited number of planes involved -- only 43 in the United States -- and because they say it is prudent to make the change as quickly as possible. At the same time, it said it did not feel the risk warranted grounding the fleet of aircraft. US Airways, one of only two American carriers who fly planes affected by the order, said Thursday they had already replaced the part. "The work was completed last week. We are scheduled to take delivery of three new ... A330s by year's end and those three will not require any ... changes," a US Airways spokesman told CNN via e-mail. Northwest is the other U.S. carrier that operates A330s, the FAA said. A spokeswoman for Delta airlines, Northwest's parent company, said affected Northwest planes are getting new parts. "We are well under way working closely with Airbus and Goodrich to install the Goodrich pitot tubes within the required timelines," Ashley Black told CNN. The devices under suspicion are the Thales Avionics pitot probes on some Airbus A330 and A340 aircraft. They measure "ram air pressure," the pressure exerted on the plane as it flies through the air, and are part of a system used to determine air speed. The FAA order requires aircraft operators to replace certain Thales pitot probes with certain Goodrich or newer-design Thales pitot probes. The FAA says the order is intended to "prevent airspeed discrepancies, which could lead to disconnect of the autopilot and/or auto-thrust functions and consequent increased pilot workload." 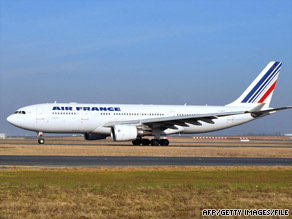 French authorities are still investigating the cause of the Air France crash. But tests conducted since the crash have brought into question the performance of the pitot tubes and authorities say there have been reports of other malfunctions on flights. No U.S. operator flies A340s. There are 302 of the aircraft worldwide. The FAA action follows an announcement by European air safety authorities earlier this week to require pitot tube replacements by September 7.